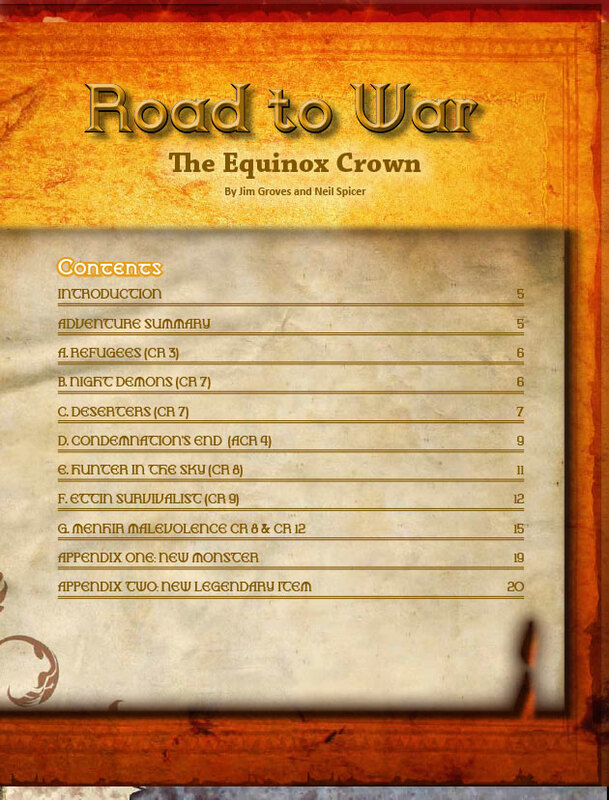 Road to War: The Equinox Crown is an adventure for 6th-level characters waging war against the fiendish powers dominating the fallen druid kingdom of the north. 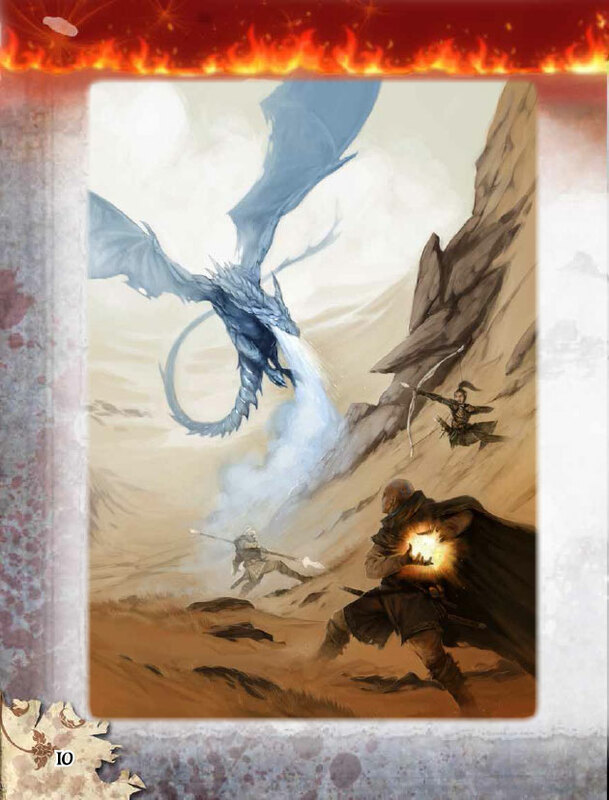 Holy crusaders march into enemy territory to recapture a location of vital strategic importance, and Road to War gives you a collection of encounters and scenarios to augment the scope and flavor of the existing adventures, replacing tedious random encounters and monotonous overland journeys with exciting and evocative events. 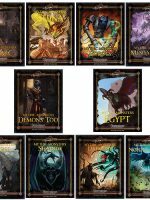 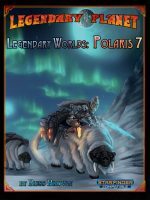 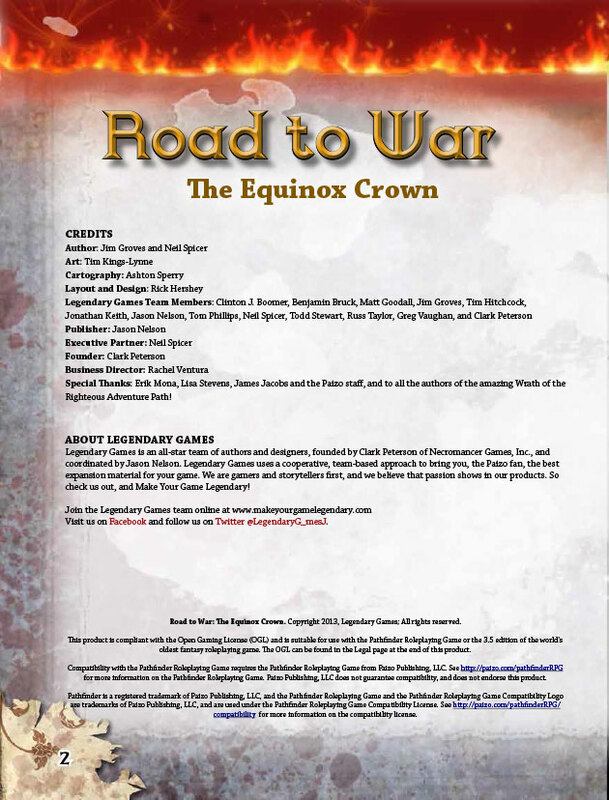 These scenarios can be played independently or linked into a unique subplot to recover the legendary Equinox Crown, a relic of the ancient druidical circles that will come in very handy later in the campaign as they face down the Locust Lord and his swarming hosts. 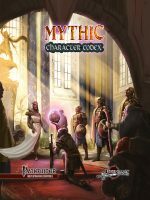 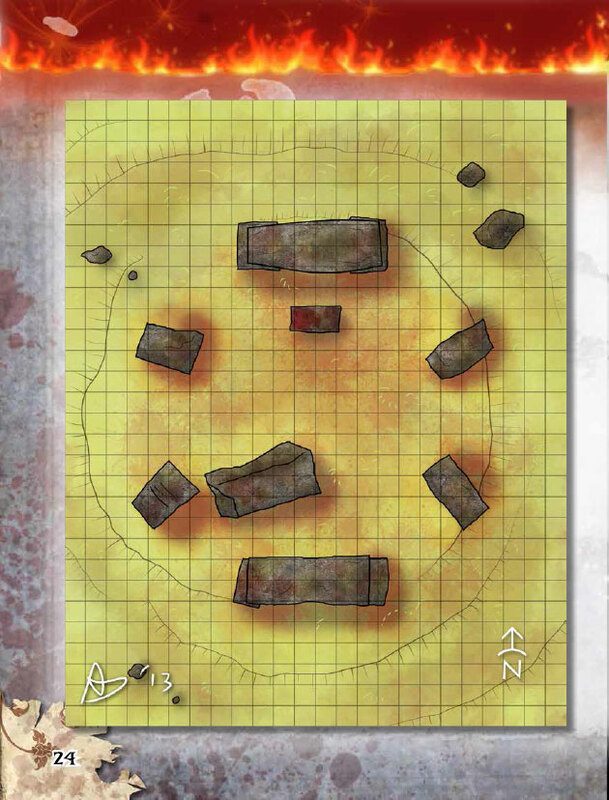 This item forms a key touchstone for many (though not all) of the encounters in Road to War, and it is designed to grow in power alongside the PCs as they rise to become mythic heroes in their own right, standing in the breach in a war the world dare not lose. 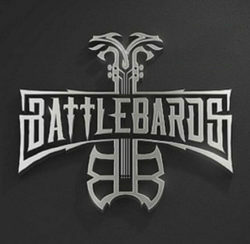 Keep your faith and your sword ready, and set out on the Road to War! 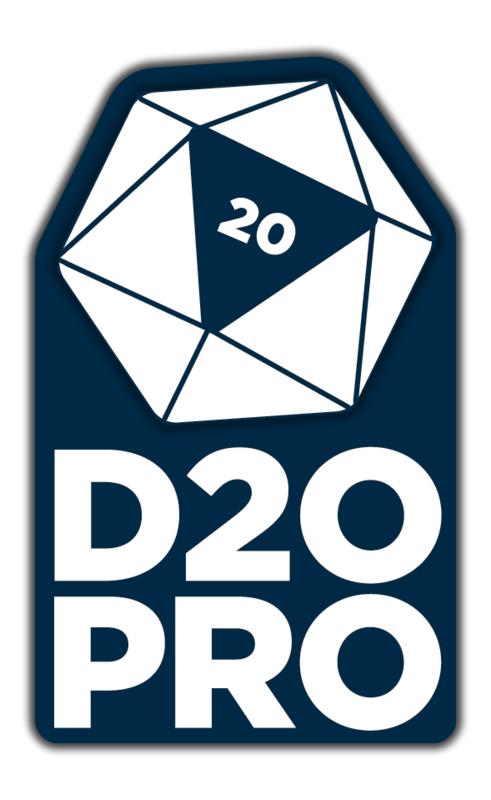 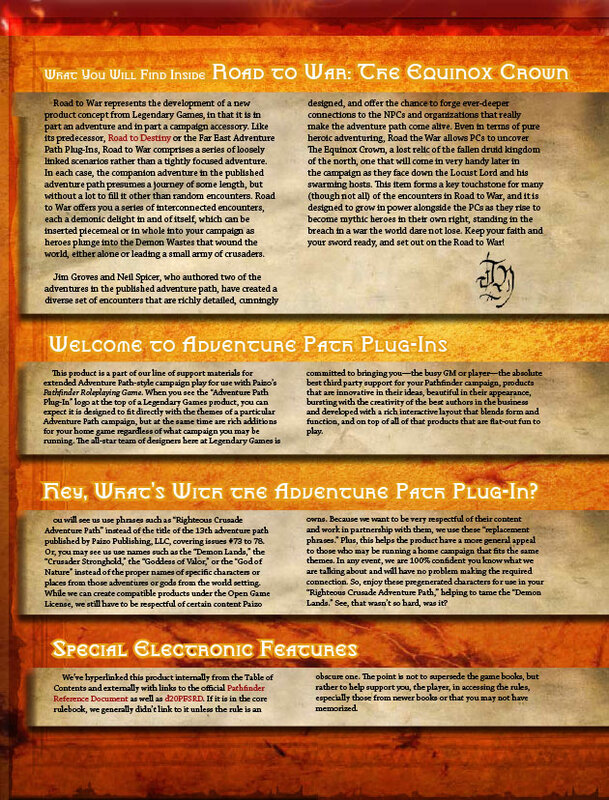 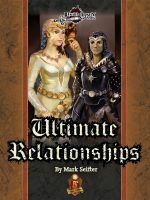 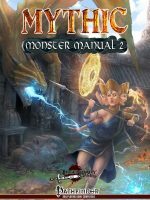 Written by the dynamic duo of Jim Groves and Neil Spicer, authors of two of the Righteous Crusade AP adventures, with art by Tim Kings-Lynne, this 26-page adventure also features a text-free player handout maps and a brand-new monster, the rock-solid durdalis, and a variety of harrowing challenges of mind, heart, and strength. 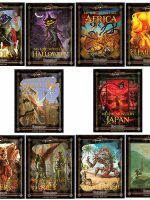 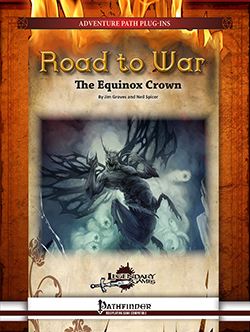 Road to War: The Equinox Crown continues Legendary Games’ tradition of bringing you outstanding content by the best authors in the business, combined with amazing art and production values and innovative layout design. 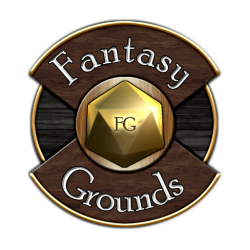 We hope you enjoy using our products as much as we enjoy making them, and that you’ll keep coming back again and again to Make Your Game Legendary!